ingredient of cell culture media, albumin is well recognized for its ability to facilitate growth of many cell types. The industry is expanding its use of high-quality, fully recombinant, current good manufacturing practice (CGMP) excipients in cryopreservation and formulation of stem cell therapies. Herein we describe the manufacturing, formulating, and handling challenges associated with the development of cell therapies and assess how the use of fully recombinant human albumin in the culture, expansion/differentiation, cryopreservation, and formulation of stem cells compares with alternative approaches. Cell heterogeneity is a main concern in cell therapy development and formulation. It is a function of the entire value chain design — from harvesting, upstream culture, and cell preservation to therapeutic administration. Consequently, biomanufacturers strive to understand and control all process steps to optimize cell viability and variability. as metals, hormones, fatty acids, and toxins, and it shuttles such molecules from areas of high concentration to sites of low concentration. Albumin constitutes about 75% of the colloidal oncotic (colloidal osmotic) pressure of blood, and its single free cysteine makes up most of the reducing equivalents in blood. These properties make albumin a useful component in development of stem cell therapies. Regulatory concerns over blood-borne contaminants (e.g., mycoplasma, viruses, and prions), potential issues with reliability of supply, and the performance variability of HSA and undefined serum all have led to an increased industry demand for more well-defined, well-characterized, and easily controlled media. Recombinant human albumin is a serum-free, CGMP raw material of high consistency and purity that enables complex culture media to be chemically defined. Regulatory agencies prefer the use of chemically defined media because comprehensive quality information must be available for their constituents. for manufacturing. Efforts to maintain cell identity and multipotency and to ensure cell survival during transformation also can lead to problems during development. Formulation, quality control of final products, storage and transportation, apoptosis, loss of identity, multipotency, and safety all can be sources of risk to product development. 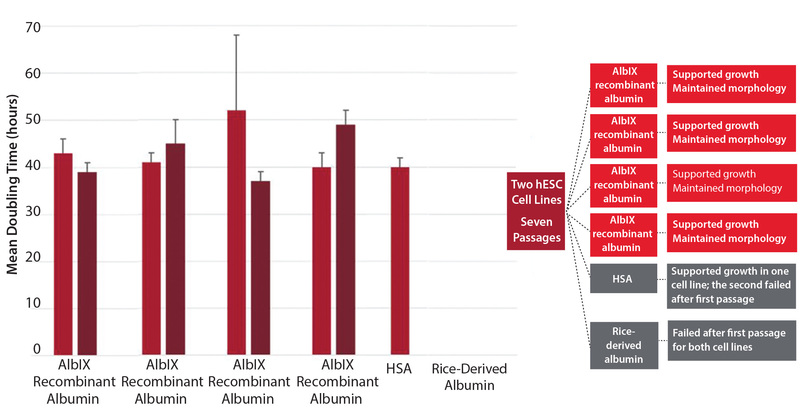 Recombinant human albumin enhances cell therapy applications, thus making it one of the best ways for cell therapy developers to improve product quality. Albumin readily coats the surface of cells, thus eliminating unwanted interaction between cell and surface. This protein also can prevent aggregation of cells in formulation, protect cells from shear stress during processing, and stabilize cells during freeze and thaw. Most important, albumin does not contain blood-derived impurities that otherwise could activate unwanted cell pathways. And recombinant albumin can help maintain the safety and efficacy of final drug products during storage. differentiated stem cell therapy dose. The first step in cryopreservation can contribute economies of scale because multiple batches can be produced either in parallel or in combination, depending on the nature of a therapy. The second step allows for flexibility in distribution and dose administration. Such advantages make cryopreservation highly useful in product development. returned to a growth medium supporting further processing or introduced to a final formulation solution, depending on whether they are to be further processed or administered. whereas products conditioned with HSA were out of specification after 24 hours. The right formulation is critical to reproducibly delivering a functional cell therapy. Typically, formulation takes place immediately after generation or thawing of differentiated cells. Following formulation, several time-consuming release assays must be performed before a product is administered to patients. As a result, the longer that cells can be maintained in a stable state, the greater the applicability and flexibility of a cell therapy. final formulation to minimize additional regulatory scrutiny. 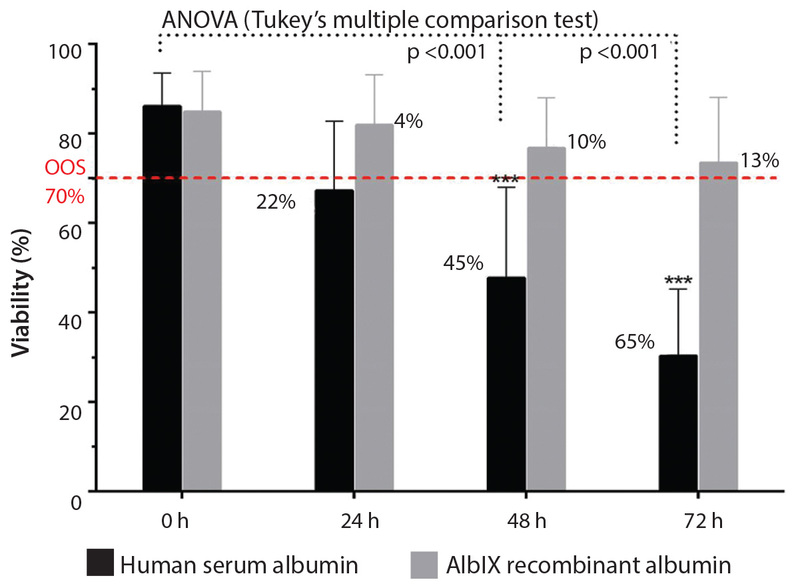 Albumedix conducted an in-house study showing that reduced variability of AlbIX recombinant albumin created the same effect across multiple batches (Figure 2). The product also supported growth and outperformed both HSA and another recombinant albumin. In many cases, cell therapies are modified to alter their function, to activate in the case of immune cells, or to express certain proteins or antigens on their surface. When such modifications are made using viral-vectored gene therapies to deliver recombinant DNA, chimeric antigen receptors, or CRISPR-Cas9 modifications, recombinant albumin may be able to improve the efficiency of such activities. An article by researchers at the University of North Carolina (1) showed that adding human serum albumin before cryopreservation or during formulation improved adenoassociated virus (AAV) vector transduction five- to seven-fold, resulting in a concomitant increase in expressed and active protein. between AAV vectors and cells. It is interesting to note that AAVs enter cells by means of their endosomes, which also is the pathway by which albumin is recycled. 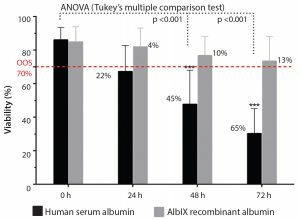 Thus, whether such vectors are used to modify cell therapies or to serve as standalone therapeutics, adding albumin can significantly improve the performance of modified cells. It is not clear whether the use of albumin similarly would improve other viral vectors, so further exploration would be warranted. 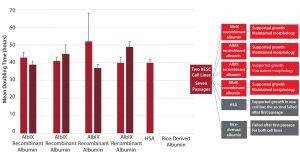 For that effort, fully recombinant albumin would be preferable to HSA in such cutting-edge technologies. regulatory advantages provided by using recombinant albumin. We acknowledge our collaborators Xcelia, a biotechnology company located at Banc de Sang I Teixits, the UAB (University Autónoma Barcelona), and Eva Jørgensen for her input and expertise in creating this article. Enhance AAV Transduction: Immediate Impact on Clinical Applications. Gene Ther. 24(1) 2017: 49–59; doi:10.1038/gt.2016.75. Phil Morton is science director of bioprocess characterization, and Dr. Daniel Shelly is business development director at Albumedix; albumedix@discoverypr.com; 44-1606-889-194.